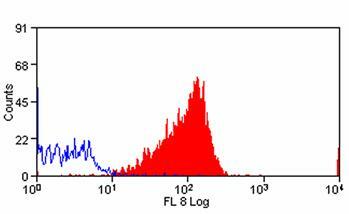 This antibody may replace item sc-136250 from Santa Cruz Biotechnology. Find tissues and cell lines supported by DNA array analysis to express SEMA4D. Find tissues and cell lines supported by RNA-seq analysis to express SEMA4D. The immunogen for anti-SEMA4D antibody: human PHA activated lymphocytes. Fusion Partners: Spleen cells from immunised BALB/c mice were fused with cells of the mouse NS1 myeloma cell line. 1. Aversa, G. G. et al. (1989) Use of monoclonal antibodies to study in vivo and in vitro activated lymphocytes. Transpl. Proc. 21: 349-350. 2. Van Vliet, S. J. et al. (1995) Species cross reactivity (human-monkey-bovine) of the adhesion structure section mAb. Leucocyte Typing V. Oxford University Press p1607-1608. 3. Yoshino, N. et al. (2000) Upgrading of flow cytometric analysis for absolute counts, cytokines and other antigenic molecules of Cynomolgus monkeys (Macaca fascicularis) by using anti-human cross-reactive antibodies. Exp. Anim. 49: 97-110.